This cheque sends Surrey bloggers running for cover! 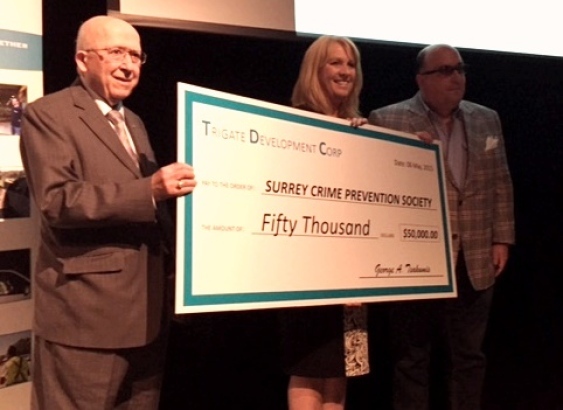 As the bullets continue to fly in Surrey, leaving citizens worried for their safety, Trigate Development Corporation steps forward and donates $50,000 to the Surrey Crime Prevention Society. This is an amazing act of corporate kindness at a time a fast growing Surrey needs it the most. This will allow the SCPS to expand coverage in Surrey and also buy new equipment. 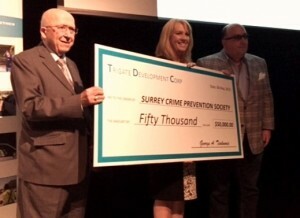 This donation is unparallelled in Surrey and Trigate and particularly the Tsakumis family should be given a standing ovation for their generosity. I find it Shocking all the local bloggers who post and take to social media venues such as Twitter and Facebook every time somebody pulls out a gun, have not metioned a word about this. Maybe if they did,more corporate citizens would step forward and do the same. That would make Surrey a safer place, don’t you think?